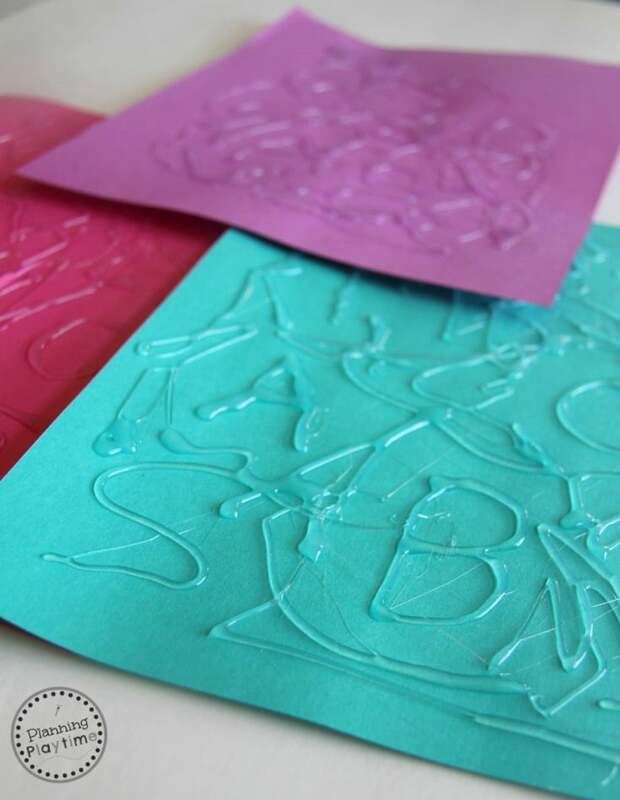 This Hot Glue Hidden Letter Find activity lets you add a touch of mystery and intrigue to the alphabet. We all have an inner treasure hunter inside of us that enjoys the search for something hidden, and young kids are no exception. In fact, if they’re like my preschooler and 2nd grader, they flat out love it. This alphabet activity can almost be a game, and it’s easy to set up for children. Grab your glue gun, construction paper and plain white paper, and a flat crayon (or a regular crayon stripped of its paper). 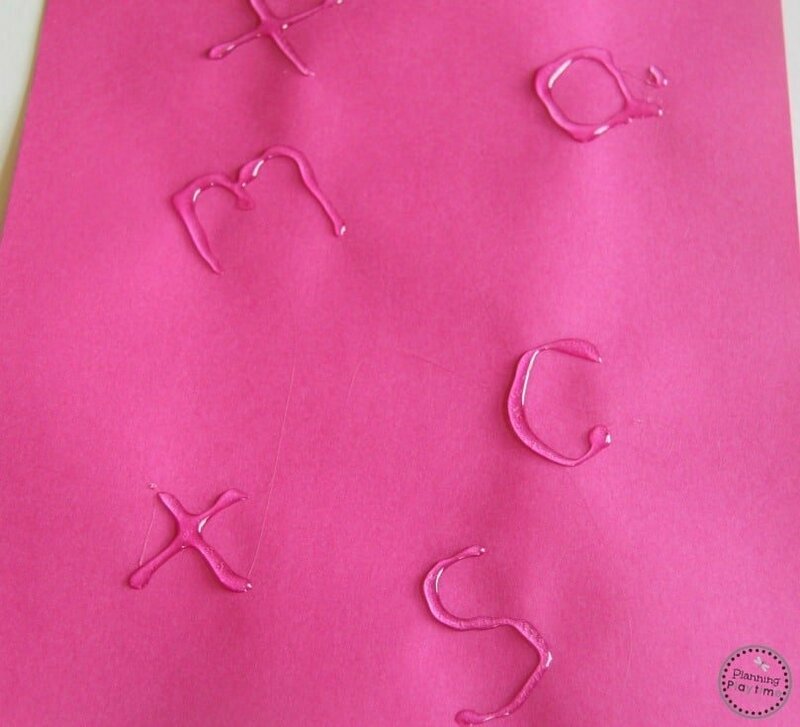 Write various letters, uppercase and lowercase as you like, on a sheet of paper using hot glue. To make it harder, write some of the letters sideways or upside down. 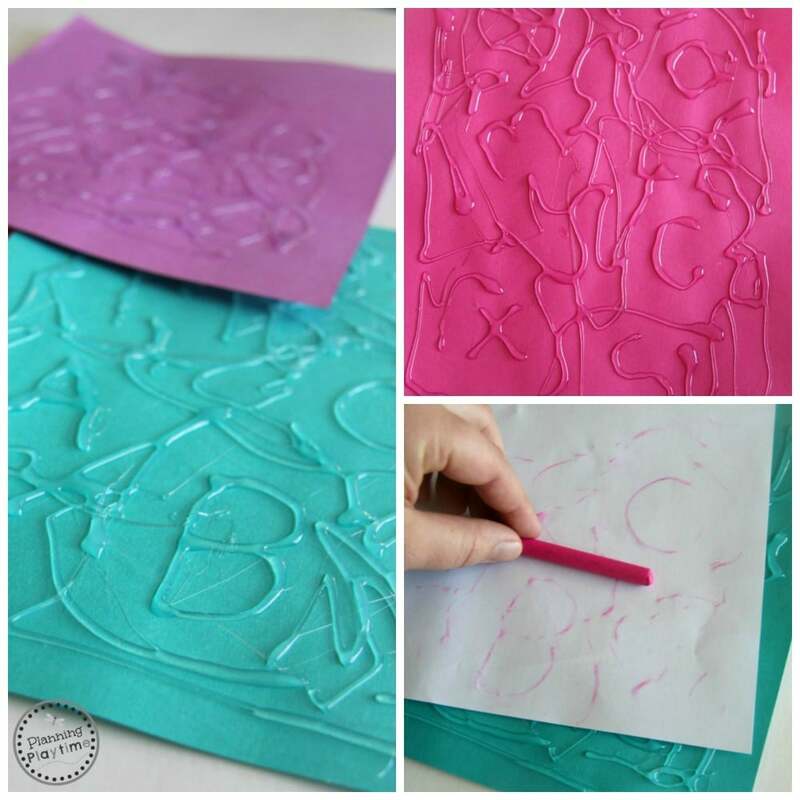 Then draw squiggles, lines, and dots with the glue gun all around the letters to hide them. 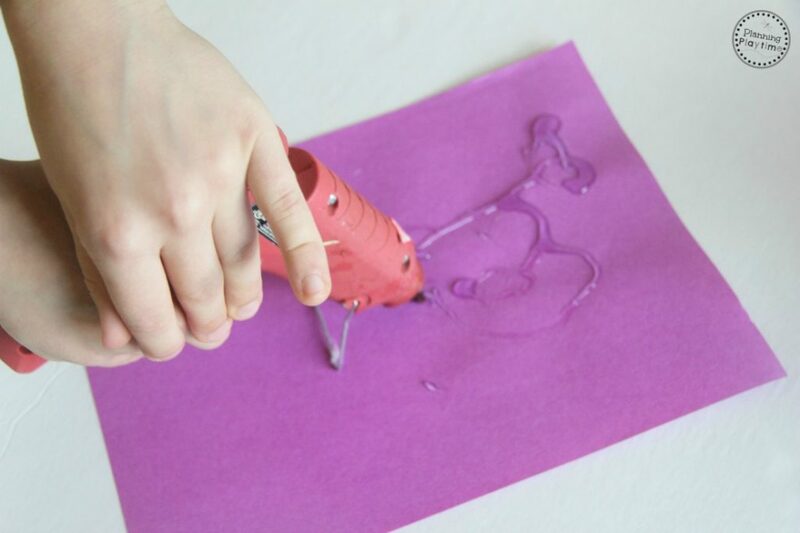 When the paper is dry (it takes just a few minutes), have the children place a sheet of white paper over the glued page and rub across the white paper using a flat crayon. See how many of the hidden letters they can find on the rubbed paper. 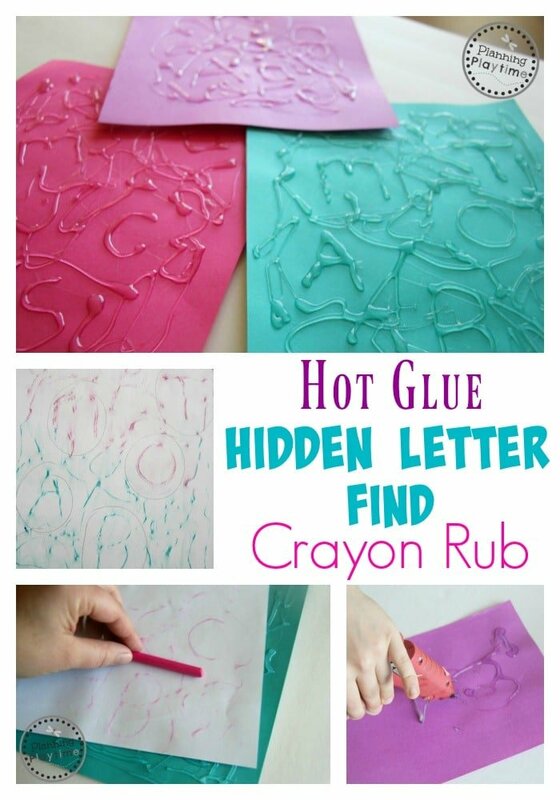 This Hot Glue Hidden Letter Find activity is great for practicing letter recognition and fine motor skills for preschoolers. And the intrigue of the hunting makes it enjoyable for older kids, too. My 2nd-grader got a kick out of joining in with my 4-year-old. Older kids could also create the glued letters for younger kids to find. Try a low temperature glue gun to be safe. With older kids, you could write cvc words or spelling list words. You could also set it up so they have to unscramble the letters for a secret message. I’d love to hear your ideas! You could take the treasure hunting aspect further, even to the party level. Find the X’s at a pirate themed pirate. 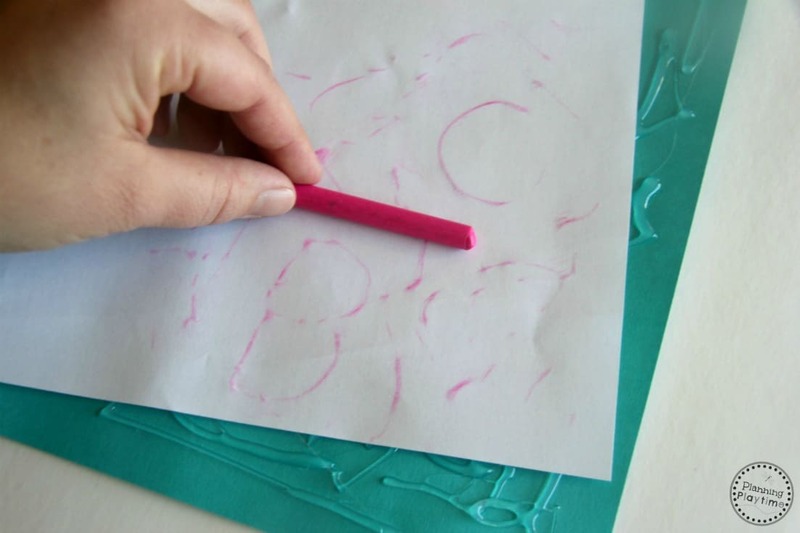 Create hot–glue treasure maps that the kids uncover by rubbing the glued paper with a crayon. Use larger paper or even poster board to glue messages on to allow more room for the fun. I’ll let you in on a little secret – it’s pretty fun to make these as the adult. All that hot glue doodling is rather therapeutic. Try it.